Another brand I shopped during Black Friday was Heather's Hues. I actually only purchased one nail polish and mostly bought wax melts. During her Black Friday sale, she posted there would be 7 random winners of a surprise gift during the sale period. I happened to be one of the winners and was very excited because I received some of the polishes I had my eye on but decided not to purchase during the sale to try and keep my Black Friday spending guilt at bay. This is one of the colors I won. 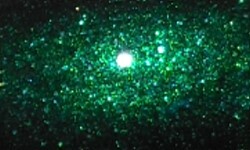 O' Christmas Tree is Christmas green sprinkled with iridescent green microflakes and shimmer as well as lime and emerald holo dust and microglitters. Color: I don't post a lot of green polishes because it's really not my most favorite color, however, I do love a rich deep green. This is a beautiful traditional shiny Christmas wrapping paper green. At least, that's what it reminds me of most. I love this richness of this green. Formula: This had a great and easy to use formula. I used 2 coats above. Price: This mini 7.5ml version which I have is $5.75. There is a larger 15ml version for $9.75 as well on Heather's Hues etsy site. Overall: This is beautiful Christmas green shade. I love the shine and shimmer in this polish. It's such a rich and luxurious color.